The Mover’s Choice: Mississauga, we simplify your moving needs. 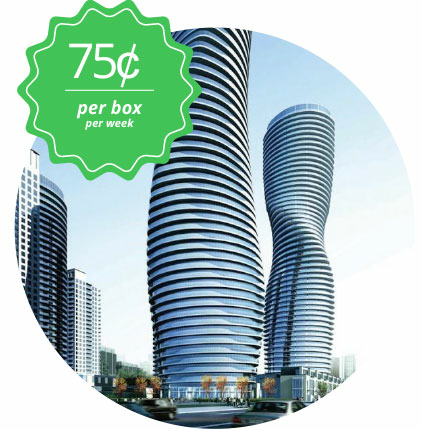 Our office is based in Mississauga, Ontario – a scenic and diverse city nestled next to Lake Ontario that has so much going on. There are hundreds of businesses located in Canada’s sixth largest city who utilize our plastic moving bin rentals for moving as they are efficient and eco-friendly. The city is innovative and culturally rich and businesses and families are always looking for new ways to simplify and save money during the moving process. We are proud to call Mississauga our headquarters – a great place to live, work and play. Landmarks include Square One, the Marilyn Monroe Condo and City Hall, located right downtown. And of course Mississauga is consistently ranked as one of Canada’s safest cities to live in, and offers the best in education and healthcare facilities. The city also has nearly 500 picturesque parks and trails. Our offer includes dollies, plastic moving boxes, stair climbers, safe movers, appliance carts, walk ramps, dock plates, moving blankets, accessories, carton sealing tape, newsprint sheets, tape, corrugated boxes, bubble wrap, kraft paper, stretch wrap, corrugated rolls and more. Call (905) 670 2778 for the best plastic moving box rentals in Mississauga. You’ll be glad you did!